In May, business journalist Mohammed Hadi, ’98, landed a plum assignment: news director of The New York Times’ Business Day section. During his undergraduate days, Mohammed Hadi, ’98, wrote for The Collegian and took some journalism classes. But as a political science major, becoming a journalist wasn’t in the offing. After graduating, he went to work for a New York hedge fund. Hadi quickly realized that finance wasn’t his calling and switched gears — to reporting on it. Fifteen years into his journalism career, Hadi has been named the news director of The New York Times’ influential Business Day section. Looking back at his indecisive early 20s now brings a wry smile. Hadi built his bona fides in the media industry steadily. After earning a master’s at Columbia University’s School of International and Public Affairs, he established himself as a respected international business journalist with his work as a reporter at the Dow Jones Newswire. He relocated to Hong Kong for a stretch, managing reporters all over the world for The Wall Street Journal and Bloomberg in Hong Kong. After returning to New York, he took the next step in his career progression, working as the executive editor of Business Insider prior to accepting his New York Times position. It's a different level of intensity, which also makes it exhausting. But it's exhilarating at the same time. 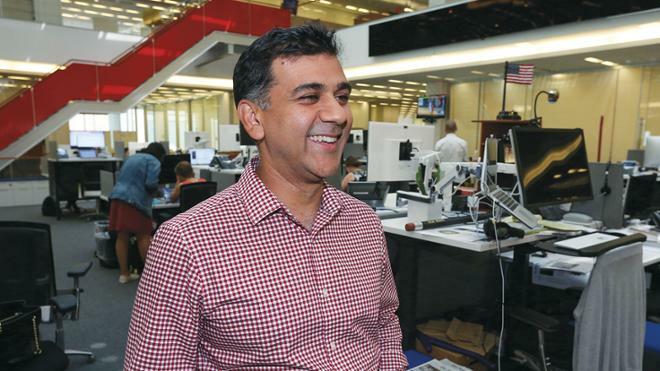 At the Times, Hadi coordinates the newspaper’s business coverage online and in print, with an emphasis on being responsive to the needs of readers. It’s a newly created position, and his responsibilities vary daily, but a few months into his tenure, Hadi is enjoying the historic paper’s pace and reach. The resources of the Times — its ability and willingness to send reporters to far-off locales in pursuit of stories, and importantly, the knowledge and talent of his colleagues — have also wowed Hadi. Hadi came to Richmond from Dubai, which wasn’t well-known among his classmates when he arrived on campus for the fall semester in 1994.